Click here to see the full-size comic strip! Obviously, George H.W. Bush was not the worst president America has seen. However, calling George HW "honorable" to anyone who remembers the dark side of his service to America is offensive. I mean, dude ran the CIA, FFS. How honorable can a guy who ran the CIA even be? I suppose it depends on your definition of the word "honorable." Hey, so drawing comics for free every week is actually hard work--throw me a couple bux on Patreon, wouldja? Thanks! Or just buy me a cuppa joe! #BillyBallpoint and #PaulETishan tussle in a battle of wits! Get Ballpoint ink in your Inbox! Buy BA stuff on Zazzle! 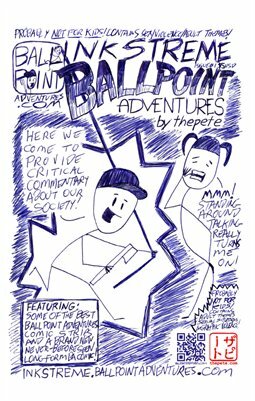 BALLPOINT ADVENTURES is drawn by thepete. Visit thepete.com if you know what's good for you, or follow him on Twitter or Instagram or Tumblr. Ballpoint Adventures for 1/19/15: Billy is Upset about All the Violence in the World! BALLPOINT ADVENTURES CLASSIC from October 1, 1998: the very 1st BA comic! Billy has news from the All #Trump News Network!